Most people will have the preset thinking that dining in a Japanese restaurant could be real expensive, especially when the restaurant is within a hotel. 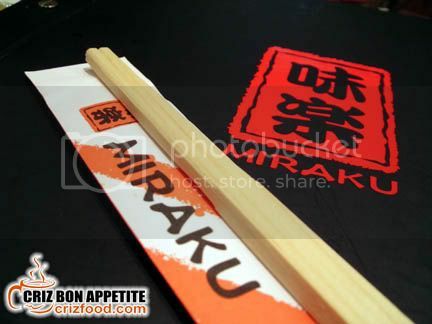 I was one of them too until I stepped foot in Miraku Japanese Restaurant located within the premises of G Hotel which was located along the promenade of our Gurney Drive beach front in Penang. Miraku is actually part of the Texchem Group with another sister company by the name of Sushi King. The restaurant is totally a different entity to management of the hotel. Thanks to the company of the 3 angels (Eunice, Siew Ying & Iris), their “Charlie” aka Jimmy and my god brother on different visits that I was able to come out with a more detailed coverage on the restaurant. To set the mood and get pampered to the max, a warm towel would be given to each diner to freshen up prior to indulging in the wonderful spread of the Japanese cuisine. 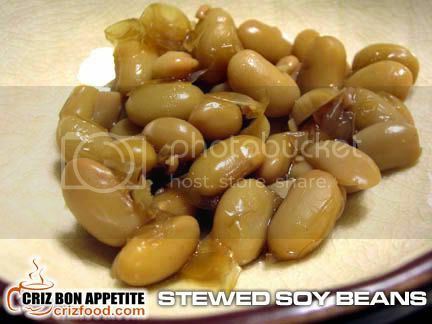 Instead of the normal peanuts or crackers as provided by most Chinese restaurants, a small plate of stewed soy beans would be given to each diner while waiting for their meals to be served. Why soy beans? It’s because soy beans remained the vital source of protein to the Japanese for generations. The soy beans were stewed in a slightly sweet salty soy sauce and had nice bites. Biting into the soy beans reminded us of how much fun Crayon Shin-chan (蠟筆小新) had while playing with the fermented version of the soy beans. We did try out the so called Natto (納豆 – RM12) and Eunice had a fun time mixing them into the rice to create as many spider web strings as she could. It sounded like the making of the next comic character? Hmm… maybe so – the Malaysian version. LOL! 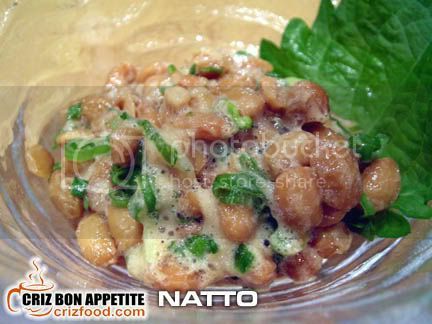 The Natto had a very ammoniacal smell and had that cheesy but bean-like taste and might not be so acceptable by most locals but they do taste a bit like vegemite with its acquired taste. The actual meal started with the Miraku Salad (RM18 – small) which would normally be served with all the set and bento meals. The freshness of the greens such as romaine lettuce, cucumber and tomato slices, combined with freshly sliced salmon, octopus and crab meat and served with tomato dressing was simply remarkable. The secret was in the sauce which had a simple combination of blended tomatoes and mayonnaise. I could not stop myself from salvaging the whole bowl of salad until the last drop. 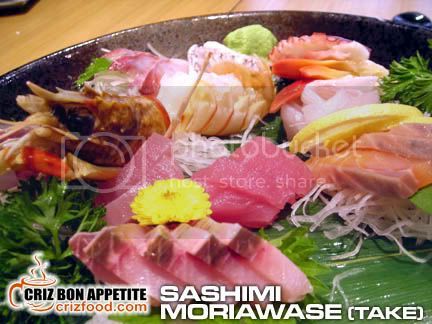 Next was the Sashimi Moriawase (Take) which was a medium sized assorted sashimi for 3 persons (RM130 per set). What you get on each visit might not be the same as the restaurant would provide only the freshest they have at that time. There would normally be an assortment of at least 6 types depending on availability. What we had consisted of salmon, tuna, amber jack, white fish, octopus and crayfish. 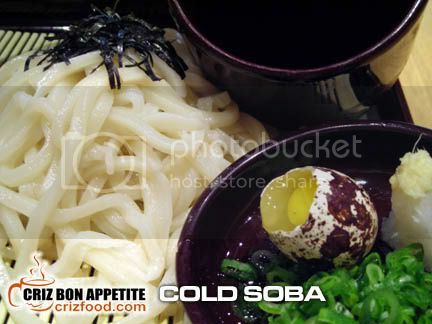 Cold noodles or Zaru Udon has always remained one of my must order dishes in any Japanese restaurants on top of the usual hot Kake Udon in soup. At Miraku, there was no exception. I tried out their Sanuki Udon (RM35 per set) which was supposed to be the most recommended and sought after udon made with flour from Kagawa. The plain udon came with the usual cold soup, radish, spring onions and wasabi. There was not much to brag about as the taste was almost just like any other cold noodles I had tasted before. In fact, I was expecting more springy bites. Maybe I should have ordered the buckwheat noodles instead for my next visit. Trying out the restaurant’s sushi spread is also a must during any visits and we did try out the Mamakari Sushi (RM6/pc). Most people would mistakenly call this fish as silver fish due to it’s shininess on the body. The name has been reserved for an insect instead. 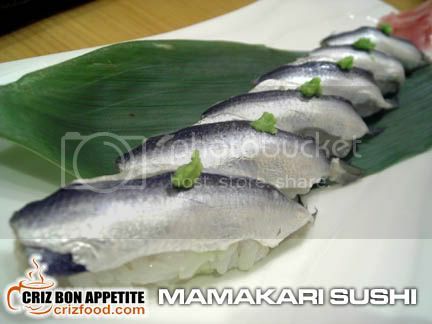 This fish is actually sardines, marinated deeply in vinegar before being used in sushi making. You won’t get the texture to be as soft as in those canned tomato based sardines. The texture for this fish would be firmer with a hint of fishy and strong vinegar after taste. It would go well with wasabi and soy sauce. The next sushi presentation which was the Dragon Roll (RM28) caught most of our attention as it was very attractive and it really looked like a dragon. The dish a deep fried prawn, wrapped with layers of sushi rice, avocado paste and garnished with some mayonnaise and prawn roes. It was colorful and tasty as well. Instead of having the usual Unagi Kabayaki which has been sweet soy sauce grilled, we tried out the freshly grilled Unagi Shirayaki (RM38). No doubt I could taste out the distinguished freshness of the grilled eel, I still prefer the sweet soy sauce grilled version. 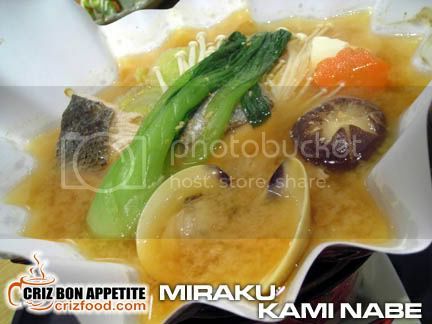 The Japanese loved Nabemono (hot clay pot) so were we when we were served the Miraku Kami Nabe (Petite Paper Hot Pot – RM36). Kami Nabe are pots made of strong washi (Japanese Paper) with an extremely dense texture. 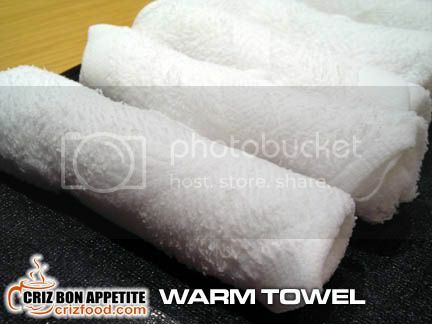 It’s normally durable to water and heat and is used mostly for stewing purposes. We had ours stewed in rich broth with lovely vegetables, mushrooms, tofu, chicken, salmon and clams. As the heat got more intense, the broth which has a thicker miso soup based taste got more flavorful with the sweetness of the salmon and chicken submerging distinctively. It was a perfect dish for a colder weather. 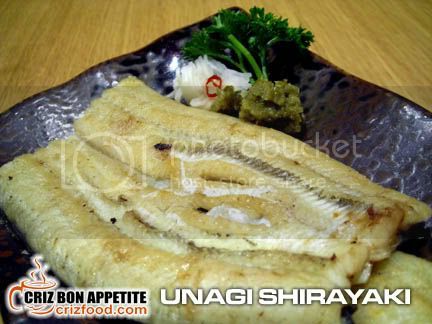 I wonder if they would produce Hoshoyaki during my next visit since they are into using washi in their cooking method. I’m sure their paper-wrapped roasted fish would taste great as well. As most of us were not so keen in having fugu (pufferfish or blowfish) which was also available at Miraku, we had something even more exotic – Gyutan Touban Yaki (RM28). These were thinly sliced ham-like beef tongues, well marinated in their special sauce with a squeeze of lemon juice and grilled to our own preference on a provided hot pot. Well, it was not bad as the dish was tasty enough for us to savor more of the rubbery-like pieces. If you feel that ordering the ala carte dishes would be too heavy for you, you could always try out the bento and set meals. One of the most ordered ones would be the Miraku Lunch Box (RM36). The bento set would surely fill you up well with bits of everything you would get from the menu such as pickled radish, salad, mixed vegetables (sato imo – Japanese yam, konnyaku – yam jelly cake, carrot, mushroom and snow peas in special soy sauce), sashimi (tuna & amber jack), grilled fish (gindara – grilled cod fish), tempura moriawase (assorted seafood and vegetables tempura), rice, chawan mushi (steamed egg with chicken, mushroom, ginkgo nut and kamaboko fish cake), miso soup and dessert of the day (red bean jelly and ice cream). This was indeed a great bargain meal and I find the combination well balanced. Another set meal you might be interested in might sound like a simple meal but it was a real filling one. The Katsu Ju Set (RM24) had the same standard side dishes such as pickled radish, salad, chawan mushi, miso soup and dessert of the day (black sesame jelly and ice cream). This set came in a bento box filled to the brim with layers of steamed Japanese rice, panko (Japanese bread crumbed) chicken and finally topped with some scrambled eggs cooked with onions gravy and garnished with nori (seaweed) strips. The whole dish combination was simple but yet perfecto as in taste. Each mouthful was filled with the awesome creaminess and cheesiness of the egg and crispy chicken slices together with the perfect grains of the Japanese steamed rice. I could take this for every meal too. For those beef lovers, you could go for the Yakiniku Zen (RM28) which would also come with the standard side dishes as above. The dish was basically simple with thinly sliced Australian beef (similar to the shabu-shabu thickness) fried with some sliced onions, scallion (spring onion) and bean sprouts in yakiniku sauce. It was a waste that by the time I had finished with my shots, the bean sprouts had gone translucent. If not, I could have imagine the crunchiness of the slightly cook sprouts with the juicy beef slices churning amazingly in my mouth. The gravy was tasty with a hint of some fruity sweetness and quality soy sauce. This was served with hot steaming Japanese rice. As for dessert, the Tempura Ice Cream (RM12) caught me yearning for more. The preparation for the dessert was totally different compared to the one I had at Haven Delights at Penang Times Square. It was truly yummilicious! A large scoop of Vanilla flavored ice cream was rolled into crushed digestive biscuits (just like those cheese cake base) and coated with tempura flour and deep fried to a golden ball like. This would then cut into four quarters and topped with sweetened azuki bean paste (red bean paste). The creaminess of the ice cream, the crunchiness of the biscuits, the crispiness of the tempura and the just nice sweetness of the azuki bean paste made this dessert something to crave for during my next visit. For those who would want to entertain your guests in large groups or in privacy, there are many dining areas and rooms available in this restaurant. In fact they have two large rooms with tall tables and six smaller ones with lower Japanese style dining experience on first come first serve basis. I’m sure no one would want to dine in this small room. From the layout itself, it could well be solely for smokers who needed a quick puff. The restaurant even has such a facility. Think of the extent of how a Japanese restaurant would sacrifice such a place just for its customers. That’s what I would call great service. When you have the guests, the quiet and cozy ambience and the food, something else is missing here. Where’s the alcohol? Miraku has them all from beer, wine, whisky, cocktail to sake (日本酒) and shouchu (燒酎). You do not have to worry about not finishing them as the restaurant has the facility to temporary “house” the leftovers up to 3 months. Here’s some of the alcohol you might expect to get here. 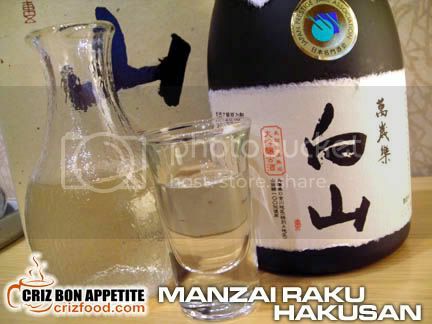 We had the privilege to try out one of the limited edition of sake in Miraku – the Manzai Raku Hakusan (萬歳楽・白山 – RM475 per 720ml bottle), a specially brewed sake from the flowing water of the Hakusan Mountain in Japan. The sake was smooth flowing and was rather mild for everyone. Although the sake was 20% in alcohol content, no one was drunk and dancing on the table ok? LOL! There are still many other ala carte and set meals available for everyone’s budget from the restaurant. Presently, in conjunction with their 3rd Anniversary celebration, they have Eat-All-You-Can Sushi at RM50++ per pax on Tuesday and Sunday until end of June 2009. On top of that, you can try out their set lunch meals (lunch only) and assorted sushi-sashimi (dinner only) at 30% off the normal price. These two promotions will also be valid until this month end. If you are familiar with the roads in Penang, it would be easy to find the restaurant as it is located within the premises of G Hotel, right between the Regency and Gurney Plaza, and facing the beach front of Gurney Drive. Moving into the long lobby of G Hotel, you might have problem locating the restaurant as it’s hidden on the first floor to the building. There are a few stairways and ample signages to lead you there but the simplest would be by using the guests’ elevator to first floor. Parking in G Hotel can be quite expensive for many. I would suggest that you drive further up and park your car at the basement car park of Gurney Plaza or find some along the beach front of Gurney Drive. 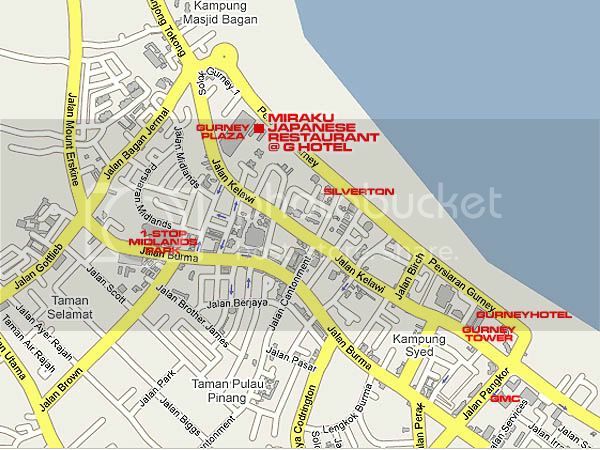 Branch Address: 1st Floor, G Hotel, 168A Persiaran Gurney, 10250 Penang, Malaysia. long time didn’t visit them already… looks like is time to revisit..
do you know they and sushi king under the same management?? they are under the texchem group. Haha… Of course I know. Its stated in the post too. I love Japanese food. The Dragon roll reminds me of the one I had in Kirishima. 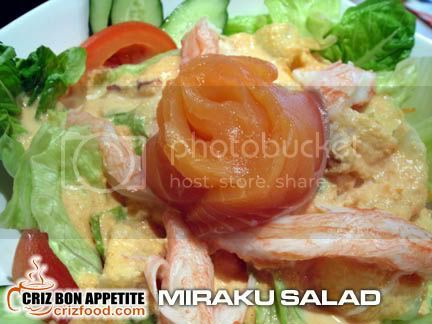 Would sure like to try out the food in Miraku too. You better be fast as the 30% offer for the set lunch would be until June 2009. Hoho, This gonna be my next target! Wow! Tempura ice-cream! Looks irresistable! The food all looks great, the combo set is worth the money. I got the feeling that Tempura ice cream is very delicious. Can I go there for just the ice cream? You could Steven but all the patrons there would get food as well. I thought we did… That was the medium size sashimi at RM130.